What expenses do you need to consider in order to make a realistic study abroad budget for your experience in the USA? Studying abroad will be one of the most exciting and rewarding experiences of your life. It is also likely to be a great life lesson that teaches you how to balance your budget, learn to prioritize expenses, and to pay attention to your spending patterns and habits. The cost to study abroad can vary wildly from country to country, course to course, availability of student grants or other tuition financing. Let’s go through the cost centers – small and large – that make up a budget. Program application fees (which are not refundable), passport application fees (if applicable), student visa costs, and your roundtrip airfare are expenses you need to meet outside of the primary costs – tuition and accommodation – that you will also have to pay before your leave for your destination. See our section on finding the best airfare and what to consider when booking your travel. Tuition: before you have begun your study abroad adventure, you will have encountered significant costs. 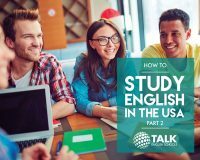 Most private English language schools in the USA require tuition and accommodation costs to be paid in advance of your arrival. Tuition is the primary expense for most study abroad programs. The cost of tuition depends on the program – and an understanding of the minimum duration that will help you meet your goals. Housing: accommodation and daily costs of living including meals, entertainment and transportation constitute the second most expensive part of studying abroad. At TALK English Schools, we provide a choice of accommodations which are included in upfront program fees. Check what is included – i.e. meals per day, laundry service for example – in the different accommodation offerings. When you are researching cost of living, first know what the exchange rate is in your destination country when compared to your currency. Remember to include prices such as groceries, eating out, cell phone plans, transportation, shows, entertainment and cinema tickets, car rental or airfares for those short vacation getaways, student discounts, bank rates, etc. This will really help you create a budget that realistically anticipates how far your money will go. Next – draw up the perfect budget for you! Know what to include as you consider a realistic budget that works for you. Download our e-Guides series and learn more!